Members of Grumets have traveled to Geneva (Switzerland) to attend the Eleventh Plenary Session of the Group on Earth Observations (GEO-XI). The meeting is serving as the frame for the initial dissemination activities of the ConnectinGEO project and allows for the presentation of its objectives and purposes. Members of Grumets are attending, from now until November 7, the V Jornadas Ibéricas de Infraestruturas de Dados Espaciais, taking place in Lisbon. Within the conference, on Friday there will be the presentation of Cómo los desarrollos en la nube pueden acercar las infraestructuras de datos espaciales al ciudadano. El caso de NiMMBus: Un nuevo servicio de MiraMon para el alojamiento y publicación de datos geospaciales. Moreover, as leaders of the Iberian and Latin-American Forum (ILAF), an Interoperability Day will be organized on Thursday November 6. New this year is the agreement with the GeoFocus journal (edited by Grumets) for the publication of selected papers from the JIIDE. The Master in Remote Sensing and GIS offers 20 seats per course to new students, plus 7 extra seats to those students from previous editions when the Master was an own title, who want to have their title validated. The course began the last September 25 with 17 new students. Geography and Environmental Sciences are the studies that provide more students, with 8 and 4 respectively. The rest of the students come from degrees like Geology (2), Topography (2) or Systems engineering. This year 4 students had asked for the validation of the previous title. The Open Geospatial Consortium (OGC) has just released the GMLJP2 standard, co-edited by Joan Masó, member of Grumets. It's the second OGC standard in which Grumets participates as editors (the first one was the WMTS). This second version of the standard is one of the outcomes of the Scaitomi project and explains how to include metadata within a JPEG2000 file using GML (in particular a variant called GMLCov). For further details check out the following link: http://www.opengeospatial.org/standards/gmljp2. In the near future, a third standard edited by Grumets, about how to code GMLCov for a JPEG2000 image, will be proposed for a final vote. Grumets have published this month a new work in an indexed journal. The article Automatic and improved radiometric correction of Landsat imagery using reference values from MODIS surface reflectance images, has been published online and in open acces in the International Journal of Applied Earth Observation and Geoinformation 33: 243-254 DOI: 10.1016/j.jag.2014.06.002. The article is offered with full acces (PDF and HTML) at: http://www.sciencedirect.com/science/article/pii/S0303243414001354. The National Aeronautics and Space Administration (NASA) has funded, through the NASA-EPSCoR program RID Alaska, a project led by a member of Grumets, Dr. Jordi Cristóbal. The project, entitled Estimating year-round surface fluxes energy in Alaska Arctic and sub​​-Arctic watersheds through remote sensing and field measurements, will last for 2 years (2014-2015) and will have the participation of researchers A. Prakash and W . Schnabel (University of Alaska), WP Kustas and M. C. Anderson (USDA-ARS Hydrology and Remote Sensing Laboratory) and C. Kongoli (University of Maryland, College Park), among others. The Open Geospatial Consortium (OGC™) membership seeks public comment on the candidate OGC Web Map Tile Service Simple Profile of the OGC Web Map Tile Service (WMTS) Interface Standard, created by the Grumets member Joan Masó. Current OGC WMTS Interface Standard implementations, also edited by Dr. Masó, return small, pre-generated map images (e.g., PNG or JPEG) or reuse cached map requests that follow a discrete set of tile matrices. The standard defines rules for multiple request/response patterns, including KVP, REST and SOAP. The candidate OGC WMTS Simple Profile aligns the currently implemented and more comprehensive OGC WMTS Interface Standard to other popular tile initiatives that are less flexible but widely adopted. Server implementations of this profile should share two common sets of tile matrices and have a mandatory RESTful interface, though other interfaces are allowed. The WMTS Simple Profile is designed to allow developers to more quickly implement the WMTS standard. The 30 day public comment period for the OGC WMTS Simple Profile ends 2014-07-12. After the OGC’s WMS Standards Working Group has addressed comments received in response to the WMTS RFC the draft documents will be submitted to the OGC Technical Committee and Planning Committee for their review and possible approval as an adopted OGC Standard. The WMTS Simple Profile RFC can be downloaded from http://www.opengeospatial.org/standards/requests/122. The OGC® is an international consortium of more than 475 companies, government agencies, research organizations, and universities participating in a consensus process to develop publicly available geospatial standards. OGC standards support interoperable solutions that "geo-enable" the Web, wireless and location-based services, and mainstream IT. Visit the OGC website at http://www.opengeospatial.org/. 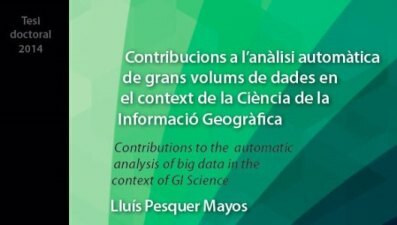 The thesis has the title "Contributions to the automatic analysis of big data in the context of GI Science" and is included in the doctoral program in Geography at UAB. It is a multidisciplinary thesis in which Geostatistical, Remote Sensing, Computer Science and Geographic Information Systems methodologies converge in order to study and offer new solutions to the automation of certain spatial analysis and image processing algorithms. The thesis supervisor is Dr. Xavier Pons. The defense will take place on Friday 13 June 2014 at 11am in the auditorium of the Centre de Recerca Matemàtica de la UAB. After a long administrative process of evaluation, the Master in Remote Sensing and Geographic Information Systems coordinated by GRUMETS has been recognized as an official master, character that it will hold in the next academic year 2014-2015. Although a number of studies have analysed the methods to monitor crop water needs, the integration of crop phenological dynamics and irrigation using water stored in reservoirs has received little attention. The GRUMETS paper “Two Mediterranean irrigation communities in front of water scarcity: a comparison using satellite image time series” (Pere Serra, Xavier Pons) Journal of Arid Environments 98: 41-51. 2013 tries to reduce such gap analysing and comparing the dynamics of certain irrigated crops (maize, alfalfa, fruit trees and poplars) located in two irrigation communities especially affected by the Drought Decree of 2007: the irrigation community of Pals, located near the Ter River, and the irrigation community of the right bank of the Muga River, with less available water resources compared with Pals. As a consequence of the research period, from 2002 to 2008, both years of water surplus and water scarcity were analysed with the objective of identifying different patterns of irrigation. A statistical analysis was applied in order to discover the relationship between crop greenness and wetness, extracted from Landsat remote sensing imagery, and the volume of stored water in two reservoirs: Susqueda, which provides water to the Pals irrigation system and Boadella, which provides water to the Muga irrigation system. Results show that both irrigation communities used two methods for water-saving: crop substitution, by decreasing the area of maize (high water consumption) and cropping other types of crops (winter cereals, for example), and timing the crop cycle, delaying or advancing sowing depending on water availability. At the same time, although the irrigation community of Muga is drier in rainfall terms than Pals, a similar crop wetness status was detected and no difference was observed between periods of water scarcity and water surplus. These results are of remarkable relevance for the Catalan Water Agency when managing potential future water scarcity. There are several approaches using mathematical models to predict the answers of the vegetation to the global warming expected for the XXI century. On the one hand, there are models that are based on physiological mechanisms of growth in a more arid environment but with a high CO2 concentration in the atmosphere, which can increase the responsiveness to the temperature rise. On the other hand there are correlative models that associate the environmental conditions where the species are present today and the projected climate scenarios about the future. The article published in Journal of Biogeography (Serra-Diaz, Josep M.; Keenan, Trevor F.; Ninyerola, Miquel; Sabaté, Santiago; Gracia, Carlos; Lloret, Francisco. Geographical patterns of congruence and incongruence between correlative species distribution models and a process-based ecophysiological growth model. Journal of Biogeography 40(10): 1928-1938. 2013) compares the congruency between the spatial pattern of vegetation (where are the species?) with the spatial pattern of vegetation growth (where the species grow better?). The maps show that in fact, the interactions between organisms are highly relevant for understanding the spatial distributions of the species since many of them may live in conditions where the species is absent. Xavier Pons is going to participate in the CREAF-DTES Conference Sinèrgies i potencialitats R+D+I which will take place on the next 19th of May 2014 in the Department of Territory and Sustainability of the Generalitat de Catalunya. During the conference, several researchers of CREAF will shortly explain their research interests (see the program). At 14.25 h, Xavier Pons will speak about the Geographic Information Systems and databases. GRUMETS are joining the 2014 edition of the annual assembly of EGU with several contributions, between them the direction and co-direction of 7 sessions of work. The assembly takes place in Vienna between 27th April - 2 May. Here are the details of the participation. Geospatial standardization activities carried out by CREAF Grumets group were presented this week at the 90th plenary meeting of the Open Geospatial Consortium (OGC) held on 24-28 March in Washington DC (coinciding with its 20th anniversary). The first presentations have shown results and developments made ​​in the 9th interoperability experiment of the Open Web Services Series both in the field of digital annotations on interactive maps and in the field of structured documentation of lineage (processes on data and sources of data) of geospatial information, applying the new standard W3C Prov. Interoperability experiments intend to demonstrate that the proposed standards really get their scientific and technical objectives. These efforts will be published as OGC technical papers in the next month (OGC Public Engineering Reports). Institutions and companies around the world are involved In OWS interoperability experiments. In the same event we participated in the meeting of representatives of regional OGC forums as representatives of the Iberian and Latin American forum OGC (ILAF) and we chaired the follow-up work meeting on the new revision of the best known and used OGC standard, the Web Map Service (WMS). We also contributed to the meeting of the geoscience research cyberinfrastructure (EarthCube) drived by the National Geosciences Foundation of the United States of America, presenting the results of the FP7 project GeoViQua in the field of the users feedback about the geospatial data. Finally, note that the OGC metadata group has decided the creation of a standardization group in order to convert the works from GeoViQua about publishing the opinions of end users of a particular geospatial data into an international standard, process that CREAF will lead. Members of GeoViQua have attended the Tenth Plenary Session of the Group on Earth Observations (GEO-X) and the GEO Week Side Events in Geneva, Switzerland. The meeting has served as the frame for the final activities of the project and has allowed for the dissemination of the final results and achievements.